The advent of fall is subtle here in Los Angeles. We don’t get the fire of autumn leaves, serving as a beacon, or the sudden damp and chill, requiring rainboots and peacoats. We tend to put our heads down during the fires and Santa Ana winds of September and October, keep going through day after day of sunny skies and 80 degree temperatures, until sometime in November we look up and notice that the air smells of leaf mold and woodsmoke, the nights have grown cold, the sycamore leaves have changed from golden green to golden brown, and the light seems to be filtered through a faint haze. Fall has arrived, not with bright banners and pounding drums, but quietly and unmistakeably. Fall also brings with it a cornucopia of autumnal produce — my beloved brussels sprouts, apples, persimmons, pears, sweet potatoes, and of course, squash. Nothing quite screams autumn like winter squash – first the pumpkins for Halloween, then pumpkin pie and suddenly the creamy orange flesh is everywhere you turn. Squash are often banished to side dish status, but they can be the centerpiece of a meal. Acorn squash, in particular, makes an appealing main course — it’s perfectly sized for built-in portion control, is less sweet than butternut or kabocha squash, lending itself well to savory preparations, and it’s pretty to boot. This acorn squash, which is halved, then baked and stuffed with a mixture of squash and quinoa, is a particularly elegant preparation — hearty, savory and beautiful enough to grace a dinner table. It’s a great option if you are planning a Thanksgiving dinner with vegetarians at the table — it can be made well in advance except for a late reheating, and is substantial and lovely enough that the vegetarians don’t feel like they’ve been relegated to the status of second class citizens. 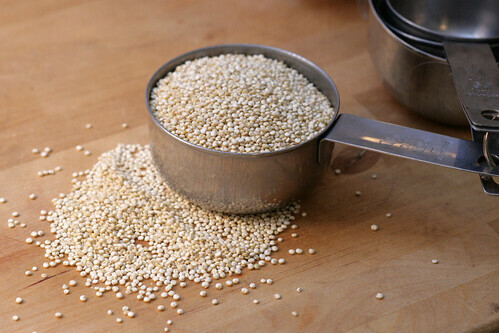 If you’re unfamiliar with quinoa (pronounced keen-wa) it’s a cross between a seed and a grain. It’s gluten free, It has a high protein content and has a complete amino acide profile, so it’s an excellent nutrient source. It has an earthy mineral flavor that is faintly reminiscent of spinach and a lovely pop when it’s cooked — almost like a caviar, but with some chew to it, like very fine barley. You should be able to find it in your local health food store. I buy mine at Trader Joe’s. 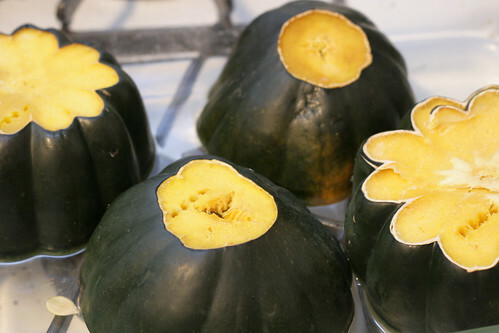 To make these lovely squashes, cut the squash in half and seed them. Cut a small piece off the bottom of each half so it sits flat. Arrange the squash seed side down in a baking dish, add 1 inch water, cover with foil and bake until the squash is tender. Then you cook the quinoa with sauteed onions and broth, similar to they way you’d make a rice pilaf, and add toasted hazelnuts, parmesan cheese, and part of your baked squash. Fill the remaining squash halves and top with cheese. At this point you can put the filled squash in the refrigerator for up to a day, and heat through just prior to serving. Preheat oven to 350°. 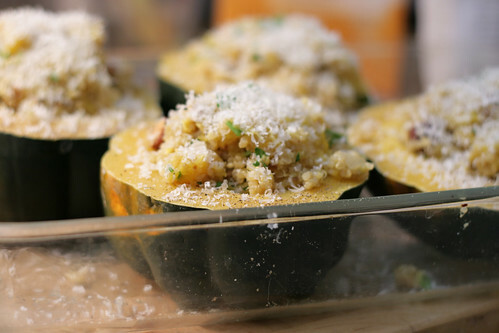 Arrange acorn squash cut side down in a baking pan. Add ½ inch of water to the pan and cover with aluminum foil. Bake until the squash are tender, about 45 to 55 minutes. Leave squash to cool. In a saucepan over medium heat, melt butter, then add onions, sauteeing until translucent and beginning to color. Add quinoa and stir to toast, about 2 minutes. Add stock. Bring to a boil. Reduce heat, cover and simmer for about 15 minutes. Scoop out the pulp of 2 squash halves and roughly chop. Add chopped squash to quinoa mixture. Add nuts, parsley and 2 T parmesan. Heat oven to 350. Bake squash until heated through -- 20-30 minutes. The toasted nuts with the cheese and the squash are a savory and flavorful dish that’s emblematic of fall — even if it’s 80 degrees in November. This looks amazing! I’m going to make this after Thanksgiving as a mid-week meal. Thanks for sharing. The quinoa recipes are popping up a lot lately. Pretty cool especially since it was unheard of to me a year ago! It definitely is a great dish, and I love your presentation! Very festive! 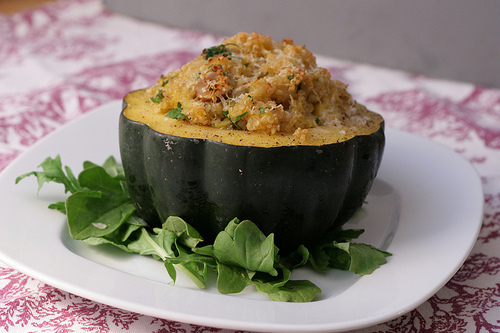 LOVE quinoa and acorn squash. I was just thinking about what to do with my acorn squash, too. Perfect timing! This looks great for any fall night, not just Thanksgiving!!! I love stuffed squash. The vegetarian version sounds fantastic!! Just beautiful! My Thanksgiving vegetarians (myself included) just make do with side dishes but this is a lovely thing to offer. Those look stunning! I’m sure you’ve made a lot of veg-heads happy with this one! Deeelish! This would never fly, unfortunately, at our Thanksgiving table, but it would likely be a hit during the week – my husband happens to be a big fan of quinoa, and love all these ingredients. It’s on the list! oooo yes. I’ve been wanting to do something like this. yours looks so pretty! What a beautiful recipe! Wow, acorn squash usually underwhelm be compared to some of the others, but I think I have to try this. Thanks!! looks beautiful! will have to try next week and make some acorn squash for C.
I needed a vegetarian recipe for my squash last nite, I knew I would find it here! I did add brown rice to it. Great as usual! Thank you. I also blogged about your champagne cocktails we made for our New Years Day Girls only party. We loved them! I haven’t used bitters for years, it brought back memories of mid-western brandy old fashions, yum! I made this tonight, it was so delicious!! I will definitely be making it again, thanks for the recipe! In my browser, Safari, the graphics are on top of some of the text here.